I drive a Prius, and when the air pressure in the tires drops five pounds, a light appears on my dash. Since last summer the light appeared every two weeks or so, and I would prompt my husband to check the air pressure. Our routine was prompt, prompt, prompt, and he would get around to filling the irascible tire. Two weeks later I would prompt, prompt, prompt and my irascible husband would fill the leaky tire. Notice a pattern here? Last week, in addition to the light, the tire started to pull. Recognizing the need to be proactive, but still not quite ready to be such, I broke from our prompt, prompt, prompt routine, and insisted that he actually look at the tire. My husband drives a forty-five (yes, 45 - you read that correctly) year-old Jag and having done so for years, his tolerance for car issues is enormous. Knowing his tolerance, my change of plan was a not a fix, but rather a Band-Aid at best. He did his duty (sort of), mentioning that I may want to have them rotated as the tire seemed to be wearing uneven. His solution, while recognized as inadequate, was just good enough to keep my inertia intact. A few days later, as I sped through heavy commuter traffic, my tire flew to pieces. Months ago, I had a nagging feeling that the tire needed attention. Weeks ago there was no doubt that the tire needed attention. Early this week, I accepted my lot, and sought my cavalier, Jag-driving husband’s advice. Ultimately, my inaction placed myself and other motorists in a dangerous situation. Not only that, as a consequence, with the cost of a tow truck, the hours lost at work, and the price of replacing two tires, rather than fixing just the one, I ended up spending a ridiculous amount of time and money when, had I handled things earlier, a small fix would have sufficed. Inaction is human nature. We are too busy to address needs, we do not want to be bothered, or we are afraid of facing the unknown. Inaction, however, comes with a price. Take a company’s website, for example. Often these sites are either not robust enough to handle visitor traffic; they rely on outdated and ineffective marketing strategies; or they lack adequate systems necessary for gathering information from interested prospects. 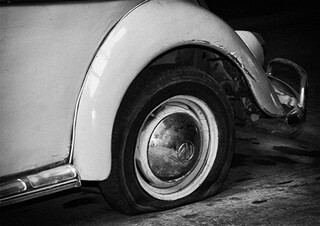 As with tire maintenance, web and enterprise inbound marketing solutions that are adopted at appropriate intervals will not only save a company time and money (not to mention drive increased sales), but they will also liberate business owners from the frustration that comes with doing nothing. Unlike the potentially serious consequences of failing to address my faulty tire, most companies do not put actual lives on the line through inaction; however, in a business sense, such inaction can put the health of their business at risk. It’s worth it, therefore, for companies to consider the potential clients they are overlooking, how much time is being wasted, and the revenue being lost by doing nothing to fix their “leaky” website. With just a kick start, and then a bit of maintenance, these questions can be addressed and new possibilities, or even a whole new business future, can be achieved. So the next time your inbound marketing lights up on your dash, don't just put a band-aid on it. Call an expert.